They say everything's bigger in Texas and barbecue is no exception. 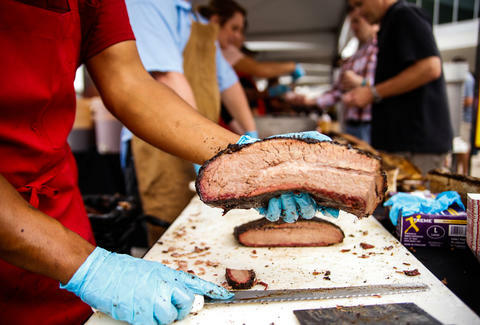 Barbecue tradition runs deep in the Lone Star State, but it's only been in the past decade that the region's signature style has stolen the national smoked meat spotlight from the pork-minded pitmasters of Tennessee and the Carolinas. It's hard to understand what makes the state's barbecue unique if you haven't spent time in Central Texas, so here's everything you need to know to eat barbecue like a true Texan. When people say "Texas-style," they mean "Central Texas-style"
South Texas focuses on barbacoa, East Texas serves chopped beef, and West Texas cooks over direct heat in a style more akin to grilling. 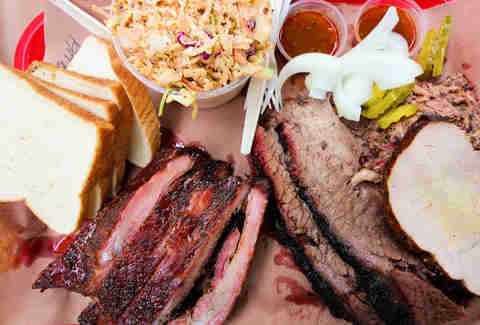 The food varies depending on where you are in the state, but when people use the term “Texas barbecue” it almost always translates the Central Texas-style of cooking brisket low and slow over indirect heat. Since you'll rarely see the others unless you're road-tripping to remote corners of the state, most of this article concerns the style associated with Central Texas. The first thing that makes Texas the iconoclast of the 'cueing world is a worship of beef over pork. The preference dates back to the cattle industry, but culturally you can chalk it up to bigger-in-Texas palates. 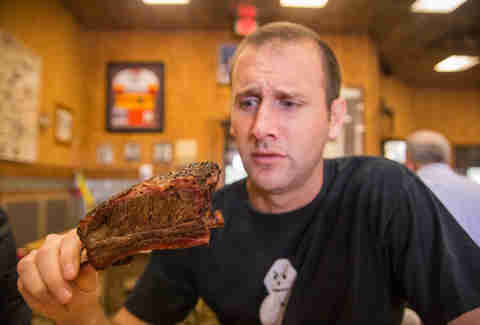 Argue all you like about proteins, but it's tough to convince a Texan that the other white meat packs more flavor than a well-cooked piece of beef. 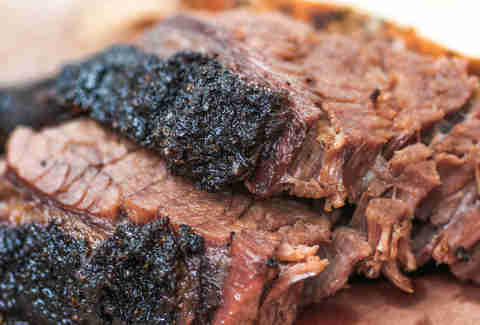 A brisket has two distinct portions, the leaner "flat" and the fattier "point." Some menus list both types, but even those that don't will happily cut from whichever side of the brisket a customer prefers. Fatty (aka “moist”) is more popular and loaded with flavor. The lower fat content of the lean side makes it harder to cook perfectly, but it's by no means a second class barbecue citizen -- it's still served with a sliver of fat cap. Pork ribs, sausage, turkey, beef ribs, and pulled pork typically round out a menu, but no plate of Texas barbecue is complete without brisket. The collagen-packed chest muscle is king and how it's cooked is considered the true measure of a pitmaster's skill. If Texas had a list of barbecue commandments, Thou Shalt Order Brisket would be No. 1. Condiment stations are always loaded with quartered white onions, pickles, and cheap white bread. There might occasionally be a charge for more premium bread or fancy pickles, but the standards should definitely come for free. 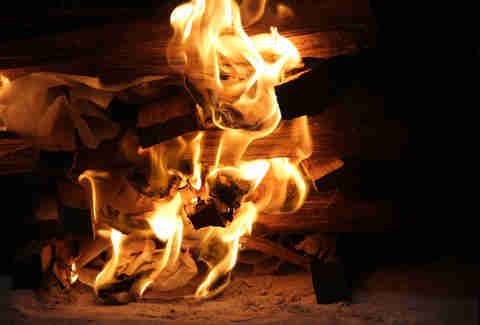 Smokers with a gas assist function have gained popularity in higher volume restaurants, but most masters still do it the old-fashioned way: a hardwood fire that's watched carefully overnight. The most common wood used in Central Texas is post oak, but you'll also see mesquite and hickory. One of the hardest parts of barbecuing is the meticulous management of a fire. If you cook too hot and fast, the collagen won't have time to render and the inherent toughness of the cut of meat will prevail. Pitmasters subscribe to a low and slow philosophy that can take up to 20 hours for each brisket. Based on regulations on indoor smokers, spatial considerations, and the low startup cost of trailers, cooking is often done outside. This further complicates the fragile ecosystem inside the smoker and tests a pitmaster's abilities. One of the primary distinctions of Central Texas BBQ is simplicity. 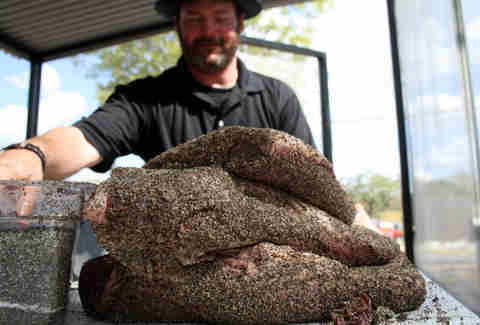 Many pitmasters will sneak in a hint of garlic powder or cayenne, but the traditional rub for a brisket is a fistful of salt and black pepper to amplify the flavor without complicating it. Since many of the best Central Texas barbecue operations are trailers that can't secure official alcohol licenses, the workaround is to hand out free beers to people waiting in line as a little present for their patience. Although most restaurants offer several varieties of tomato-based table sauce, brisket is almost always served dry. Purists and snobby food writers will say that sauce overwhelms the meat and is the equivalent of squirting ketchup on a steak. In a throwback to German and Czech meat market roots, most Texas barbecue restaurants sell meat by the pound. It's ordered and sliced at a counter, then presented on a plastic tray covered in butcher paper. Expect to use that tray as a communal plate. When the primary product takes upwards of 15 hours to cook and space inside a smoker is finite, supplies are limited. 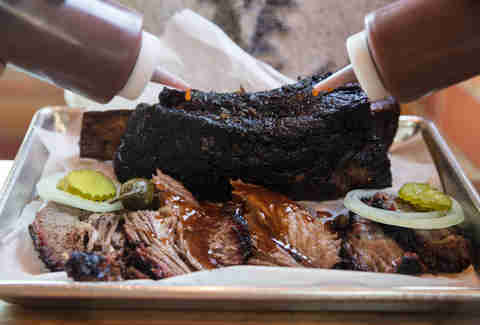 As a result, many of the state's premier barbecue spots are only able to cook enough meat to last through a lunch rush, so not many people eat brisket for dinner. 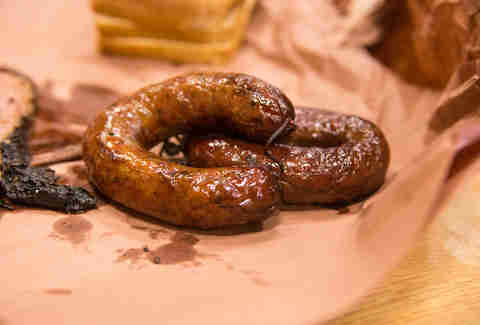 German and Czech immigrants have had a big influence on the state, earning sausage an important place on any Texas barbecue menu. Elgin is the state's sausage capital and the the birthplace of “hot guts," an all-beef sausage that the originators at Southside Market proudly sell wholesale to many restaurants. Pitmasters who make their own will often offer more than one variety, from staples like jalapeño cheese to more creative styles that incorporate flavors from other global cuisines. Although not everyone likes to get down and dirty, traditionalists will tell you to ignore forks and knives and grab that slab of moist brisket with your hands. You'll occasionally even find old-school joints that don't offer cutlery, like Kreuz Market in Lockhart. Hour-long lines make for high levels of anticipation, and a customary reward for the wait is a tiny slice of brisket as soon as a customer reaches the counter. Beef ribs have become the darling of the barbecue world in recent years thanks to their intense flavor, as well as an appearance that looks straight out of The Flintstones. Most beef ribs clock in at around 2lbs, so anticipate leftovers. Dan Gentile is a staff writer at Thrillist. He lives in Austin, TX, the smoked meat capital of the universe. Follow him to a half pound of moist brisket at @Dannosphere.